Amid all the anxiety over debt-laden European countries and their banks, few seem to have noticed ominous signs for Australia. Late last week, as fears really began to rise about the Eurozone, spreads on credit default swaps (CDS) for Australia’s sovereign debt widened the most of all countries in the world except New Zealand. What does that mean? Simply, as fears rose about European countries defaulting on their debts, the cost of taking out “insurance” against Australia defaulting on its sovereign debt increased by more than almost every other country. Could this reflect the markets losing confidence in Rudd Labor’s ability to manage the economy? After all, this dramatic deterioration in the markets’ perception of our ability to repay our Rudd-spent sovereign debts also coincides with the government’s announcement of their new Resources Super-Profits Tax – a tax on our only remaining productive sector (apart from agriculture). It also comes just days before the next Budget… one which few could seriously believe will genuinely rein in Rudd Labor’s massively wasteful spending and set a determined course for a return to budget surplus. When it comes to Rudd Labor’s economic (mis)management, it seems the markets are speaking loud and clear. Even as many Americans still struggle to recover from the country’s worst economic downturn since the Great Depression, another crisis – one that will be even worse than the current one – is looming, according to a new report from a group of leading economists, financiers, and former federal regulators. The report warns that the country is now immersed in a “doomsday cycle” wherein banks use borrowed money to take massive risks in an attempt to pay big dividends to shareholders and big bonuses to management – and when the risks go wrong, the banks receive taxpayer bailouts from the government. 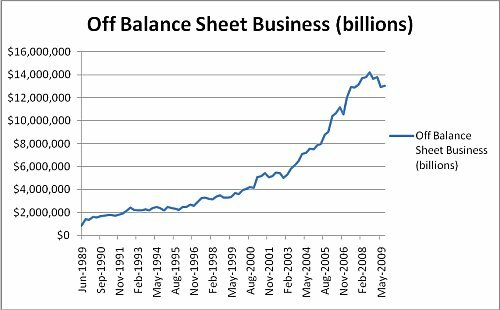 According to data from the Reserve Bank of Australia, the Australian banking system has $13 Trillion in Off Balance Sheet business, compared with only $2.59 Trillion in On Balance Sheet business. You see, $13 trillion is $13 trillion. It’s the big unspoken risk that the banks have created for themselves. So let me make one thing clear. When you hear all the talk about banks deleveraging and de-risking, don’t believe a word of it. As you can see from the chart above, they’re in as deep as they’ve ever been. It is not literally impossible that the Federal Reserve could unleash the Zimbabwe option and repudiate the national debt indirectly through hyperinflation, rather than have the Treasury repudiate it directly. But my guess is that, faced with the alternatives of seeing both the dollar and the debt become worthless or defaulting on the debt while saving the dollar, the U.S. government will choose the latter.